By Vivien Schweitzer. 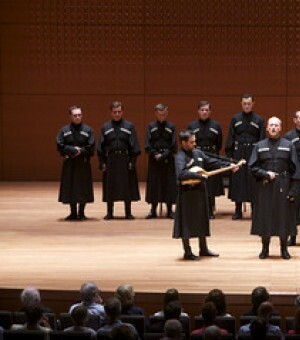 Published: August 17, 2010, "The New York Times"
As wild and unfamiliar yodeling unfolded over startling harmonies and complex rhythmic patterns in Alice Tully Hall on Saturday evening, it seemed that despite the male choir’s traditional costumes, the song must surely be the work of some new experimental composer. But “Khasanbegura” is a traditional Georgian song, with music thought to predate its 19th-century text. Like other of the harmonically quirky polyphonic songs performed by the stellar Ensemble Basiani, “Khasanbegura” sounded cutting-edge, certainly to Western ears. Georgia’s three-voiced polyphonic tradition dates back to pagan times and is currently undergoing a revival there. The wild, primeval folk songs on Saturday were interspersed with the gentler harmonies of lyric songs, like the exquisitely rendered “Tsintsqaro” and “Vagiorko Ma” (“You Don’t Love Me”) and the hauntingly beautiful “Shen Khar Venakhi” (“You Are the Vine”), a 12th-century hymn. The program also featured a striking Christmas chant, earthy work songs and “Chakrulo.” In this ornamental table song, given a gripping performance here, a melismatic solo voice hovered over a drone, both increasing to fever-pitch intensity.